Being in the hospitality industry exudes class, glamour and a certain kind of air that’s above the normal kind of business because it offers both a product as well as service all at the same time. 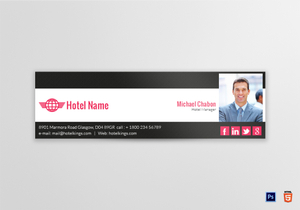 When you own or manage a hotel, especially one that comes from a chain of prominent hotels from all over the world, your very own email signature design should reflect the prominence of your position. Most well-known international hotels are a product in themselves due to their name which has value that people from all walks of life recognize even just by the name or the logo itself. If you happen to own or manage the hotel, your name should be synonymous with your hotel’s product and service that people could appreciate and be swayed just by your sales spiel alone. 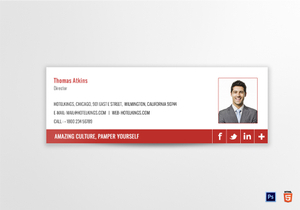 We at Best Templates recognize the need to have quality and service attached to your name. What your own brand and the contents of your correspondence carry is more important than any fancy designs that goes along with it. That’s why we give value to both your product, content, and most especially your signature that carry weight to the hotel’s service you represent. We just don’t stop at first impressions. We also recognize the value of last impressions. That’s why our fully customizable hotel email signature templates are offered with your name and brand of service in mind. Our templates are made from the finest quality designs from our team of handpicked custom illustrators, designers and graphic artists from all over the world who are under strict instructions to produce only the finest quality templates using the most modern tools that technology can offer. These easy to use, downloadable template designs give you a choice between minimal style designs and colorful signature designs depending on your hotel’s theme and colors. You can modify and customize your own designs using commonly used application software such as Photoshop and HTML which makes it very easy for you to make your own signature designs even without the aid of a professional designer. The best thing about all these is that our templates are so affordable, you’d be amazed at how we kept our prices so low! On top of that, our templates are produced using only the finest quality high definition 300 dpi resolution CMYK or RGB color modes that enhances your signature with amazing clarity and stunning colors. We can even make your signature in 3D design! That’s how impressive our templates are! We are not here to brag, however. All these templates are available for you to choose from at an unbelievable price range. 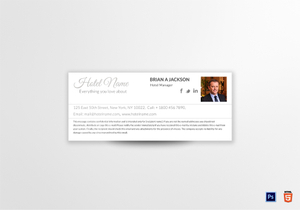 You can select several designs depending on your stationery color and design and you’ll have several stylized and fully customized hotel email signature that enhances the look of your email’s content. Not only that, you can even have your signature printed together with your contact details on any of your online social media accounts or have them printed on your hotel advertisement in magazines. This guarantees you meeting your target market to a far-reaching audience from every aspect, both business and personal.